When a potential client comes to your website, how easy is it for them to contact you? And more important — how persuasive is it in getting them to contact you? Your prospects are busy people. They don’t want to have to “figure out” how to get in touch with you. If any part of contacting you is difficult or time-consuming, they’re going to click on their back button. Your website can reduce “friction” by providing an easy way to contact you. Better yet, you can design your contact page to guide your prospects towards filling out your contact form and qualify themselves. 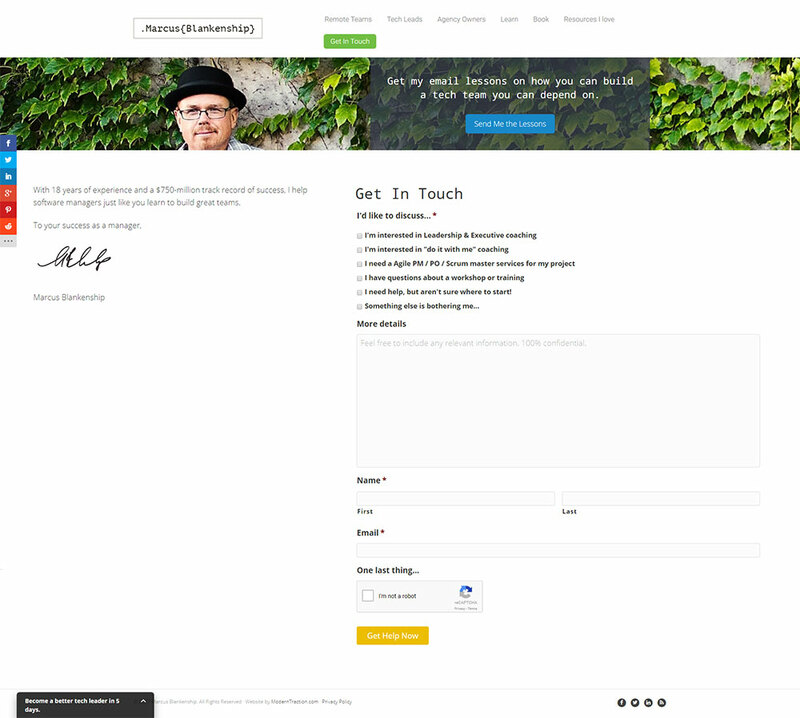 A great contact page can “charge” your website’s lead-generation potential. After all, the goal of your website is to bring you more leads and conversations with your prospects. And your contact page can “make or break” your website’s conversion rate. Simply having a contact form on a contact page is the first step in changing your website from an extended business card to a lead-generation machine. That said, it’s not enticing enough on its own to persuade your prospects to fill it out. Why should your prospect take 30 seconds of their time (which is a lot on the Internet) to fill out your form? If you don’t answer this on your contact page, you won’t get many submissions. Think of your contact page as a landing page. It’s one of the most critical landing pages on your site. It has one goal — to get your prospect to contact you in the way that is best for them, and best for you. You want your prospects to take action on this page. A simple contact form with a box for “Name, Email, and Message” is not enough to get them to act unless they know you well already, or are in desperate need of your help. Don’t count on either. Like any other sales or landing page, you need to sell your prospect on WHY they should fill out your form. Write 3 benefits for your prospect of them filling out your contact form. You can and should use some social proof on this page to help them take this action. What will they gain from filling out your form? What will you do once they submit this information? How long will it take for you to get back to them? There is a critical balance on this page between the amount of qualification you do and how easy it is for your prospective client to use. The fewer form fields you use (places where your prospect enters information), the more people will fill out your form. If you aren’t getting any leads through your website, a 2 field free consultation form will help you get the ball rolling. That said, as a consultant, you aren’t looking for quantity. You’re looking for quality. The key is creating credibility and quality relationships with customers and not focus on meaningless hits. Five thousand hits a day from irrelevant people are worthless. Putting more questions for your form is preferable if you get too many leads through your website. When you start to get more quantity than quality, update your form to ask questions and “filter out” the wrong leads. More on this in the examples below. Kurt Elster’s contact page is the epitome of consulting website design. As one of the most in-demand Shopify consultants in the world, his contact page reflects how in demand his services in. Although his contact page has 0 form fields, it gives his prospects many ways to work with him or get in touch. He gives clear examples of what kind of inquiries he is accepting, as well as what he’ll pass on. In the next section, he gives 4 links for various ways to get in touch, depending on the prospect’s needs. 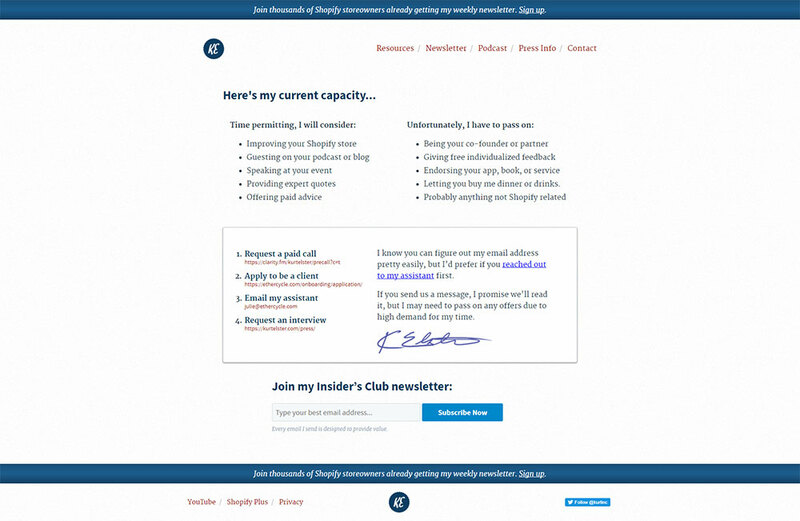 At the end, a link to his “Insider’s Club” newsletter, for those not ready to contact him yet. 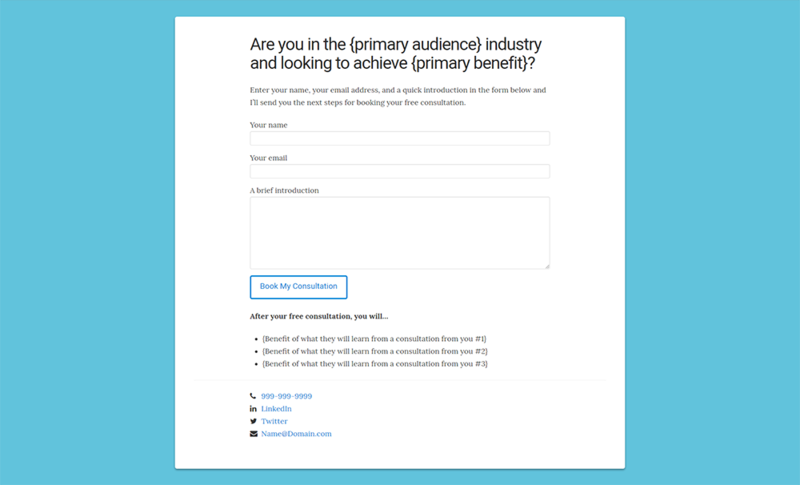 The style of this contact page is ideal for consultants who already receive many leads, and want to filter out the bad ones. 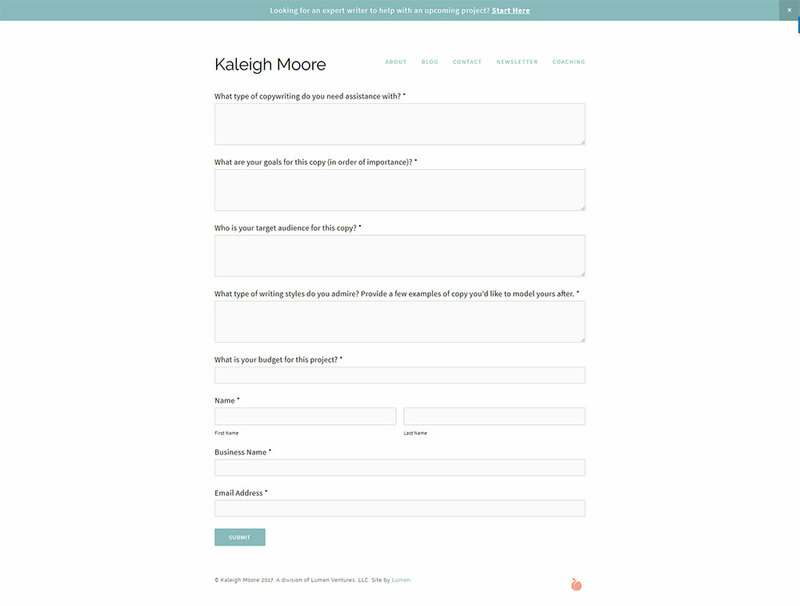 Opposite of Kurts, but still just as powerful, Kaleigh Moore’s contact page gives her everything she needs to know about her prospect to see if they would make a good fit. She has 5 questions which will tell her whether or not the prospect is a good fit. They also give her the information she needs to write an effective proposal as well. Any prospective client who takes the time to fill out her form is a very interested in working with her. Her form acts as a filter. Only the best leads will fill out her form. Marcus Blankenship’s contact page is simple, straightforward, and provides a great user experience for both him and his prospects. He leads into his form with what his prospective client would like to discuss, which most likely leads to either further questions in an automation sequence or is forwarded into a specific email folder. He also uses a Captcha form to rule out any spam. This may lower his conversion rate, but increases the quality of his leads. Use Marcus’ contact page as an example for your own website if you want to receive more leads but still have some form of qualification. DO: Use your key contact information site-wide. Until your website is content heavy, you should have your contact information visible in the header or footer of your website. This means that your email address, phone number, or LinkedIn page are easily visible on every page of your website (other than your landing pages). If you prefer to talk on the phone, then list your phone number (clickable to open up Skype, or if they are on your phone, can begin the call automatically) so they can call you with the tap of a button. Either way, to increase conversions on your website, one of your main “calls-to-actions” should lead your prospect to contact you. DON’T: Use “Send” or “Submit” for your contact form button. Although this may seem like a minor detail, it says a lot about your website and your salesmanship. What sounds more enticing to you? The first two are simple actions — the latter two create benefits for your prospect. Which do you think they are more likely to click on? This button IS your call-to-action. The copy you use on this button will determine how many people will actually click it. When you take your prospect straight to their email inbox you’re giving them a blank page. You’re creating work for them instead of making it easy. You’re also opening yourself up to more spam, and with 0 filters, the responses you’ll be getting will be low quality. Instead, use the examples above and create a form to preface the conversation. Guide your prospective client as to what you want to know about them before they get in touch. Bring up your consulting website’s contact page. Have you simply inserted a form with no direction or guidance? If you have, you need to rethink how you use this page so that you can get more out of it. For starters who want to start getting more leads out of their website, I recommend offering a free consultation. Tell them 3 benefits of what they will get out of a consultation with you. Make sure you are using Google Analytics, Gravity Forms, or some other form of analytics tracking software so that you can track the conversion rate on this page. Without knowing the rate at which people are filling out your form, you won’t be able to improve it. And if you don’t know how many people come to your website or contact page, you won’t know whether you’re suffering from a traffic problem or a conversion problem. Your contact page can mean the difference between a great lead reaching out to you to talk — or putting it off until later and never contacting you. Make it count.